many who believe deeply in the Ceres mission: to transform the economy to build a sustainable future for people and that planet. Reducing emissions, deploying renewable energy and energy efficiency, and cutting energy usage is more than just the right thing to do, it’s also a good investment. The ratio of clean energy jobs to fossil fuel industry jobs is 5:1. Clean energy jobs are good jobs, and cannot be outsourced. In fact, a recent DOE report shows that there were 2.2 million US jobs in energy efficiency in 2016, up from approximately 1.9 million in 2016, according to Energy Efficiency Jobs in America, a report co-funded by E4TheFuture. There are also nearly 4.5 million US jobs in wind and solar. Coal mining now represents a mere 76,572 jobs – a drop in the bucket compared to clean energy. According to Power Forward 3.0, a report released April 25, 2017, 63% of Fortune 100 companies and 44% of Fortune 500 companies have adopted or retained energy sustainability goals and targets, and these numbers are rising sharply. 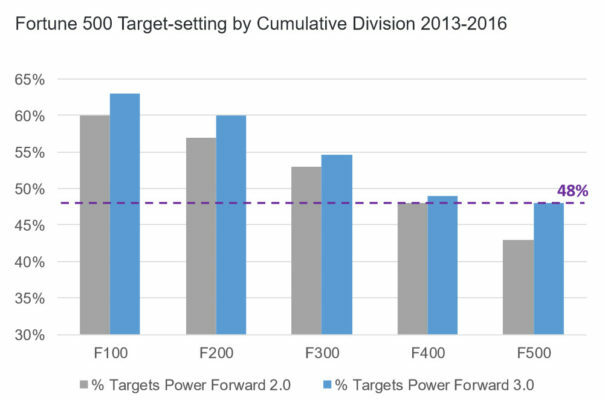 This chart from Power Forward 3.0 shows the increases in target setting among Fortune 500 companies from just 2013 to 2016. These goals led to 80,000 emissions-reducing projects resulting in $37 billion in savings captured by 190 companies in 2016. Today, many investors have developed criteria for funding companies, and will not consider investing in organizations that do not have a substantial sustainability commitment. Recently, Morgan Stanley announced the launch of a $125 million global impact fund. James Gorman, Morgan Stanley’s chairman and CEO said in a statement that “the fund emphasizes our belief as a firm that there are opportunities for investors of all types to pursue both positive financial return and sustainable impact.” Businesses recognize that clean energy and sustainability jobs are jobs of the future. Many Fortune 500 companies are now hiring sustainability officers, creating a robust clean industry of professionals dedicated to combating the devastating impacts of climate change. Businesses have a unique opportunity to make an impact on national and global scales to influence commitment to clean energy and emission reduction goals. Politicians listen to and care about businesses. Companies are influencing the US to remain in the Paris Agreement and to make policy decisions that will protect the health and wellbeing of future generations and our planet. In fact, approximately 280 investors with over $1.7 trillion in assets under management signed a letter urging G7 to stand by the Paris Agreement (signatures are still being accepted). It is up to all of us, from non-profit organizations to large Fortune 100 enterprises, to stand up for sound and cost effective policies. Data analysis proves when companies double down on their clean energy initiatives, favorable policy results at federal and state levels. Business voices have the power to enact meaningful change – and to prevent devastating changes from taking place. Federally funded clean energy programs, such as ENERGY STAR and the Weatherization Assistance Program (WAP) create jobs and are economically beneficial in all 50 states and must be funded. With legislative uncertainty in the Pennsylvania and other states, businesses realize that positive clean energy policies help their bottom lines. Now is the time to step up, to write letters to state and federal governments, and to make businesses voices heard. Contact E4TheFuture for information on engagement opportunities to advance the clean energy industry. Today, there’s a lot at stake. –Rachel Ehrman is a Policy Associate at E4TheFuture.